(Front row from left) Thom Jones, John Neill, Mike Davis, Roger Swigart, Rod Haseltine, Lane O'Bryon, Greg Davidson, Benjey Schneider, Robert Balaicuis. (Second row from left) Denny Marzano, David Brown, Doran Veith, Brent Davis, Darin Struble, Dave Kohlmeyer, Mike Carroll, Mike Thomas, Craig Winsor. (Third row from left) asst. coach Paul Savard, head coach John McGillivray, Jason Crary, Randy Southwell, Johnny Milligan, Dan Walsh, Tommy Salley, Warren Sayre, Jeff Davis. 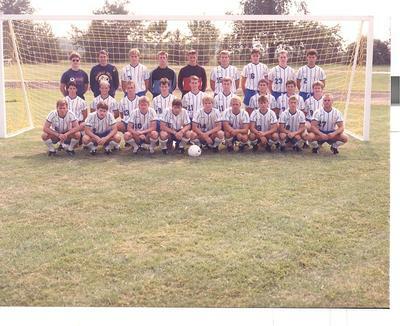 Cedarville College, "Cedarville College Team" (1989). Men's Soccer Image Gallery. 111.